Anaheim, Calif. – Merry holiday moments from Disney theme parks around the world and a star-studded cast of entertainers will launch a “25 Days of Christmas” countdown when “The Wonderful World of Disney: Magical Holiday Celebration” airs Thursday, Nov. 30, 2017, from 9:00–11:00 p.m. EST on The ABC Television Network. The magical two-hour event will be hosted by Emmy® Award-winner Julianne Hough, multiplatinum recording artist and television personality Nick Lachey, and sports star, broadcast correspondent and commentator Jesse Palmer. The show will give viewers a front-row seat to a Disney Christmas party like no other – a family holiday tradition brimming with colorful lights, snow flurries, memorable music and more. From the Cinderella Castle stage at Magic Kingdom Park at Walt Disney World Resort in Florida, Hough and Lachey will perform a spectacular opening number named for the primetime special. 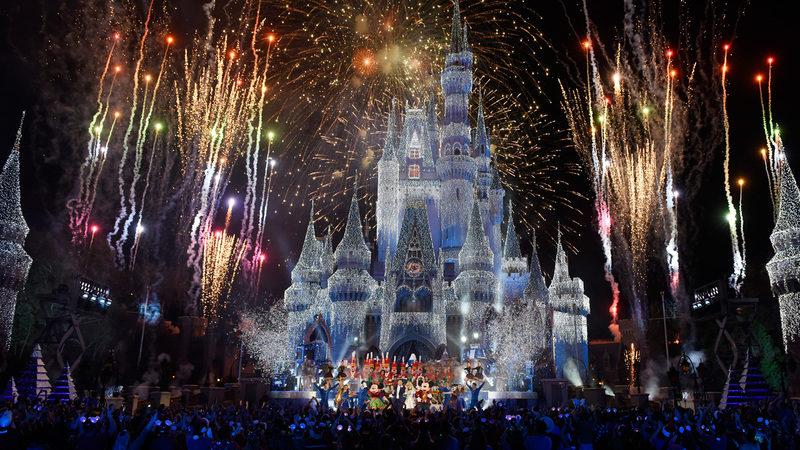 The holiday special’s other unforgettable, wish-come-true moments will include an extraordinary castle lighting extravaganza from Disney theme parks around the world – traveling the globe from California and Florida to Paris, Shanghai and Hong Kong. The force will be with all who tune in for a sneak peek at Disney’s new Star Wars-themed lands, Star Wars: Galaxy’s Edge, opening at both Disneyland Park in California and Disney’s Hollywood Studios at Walt Disney World Resort in Florida in 2019. The new lands promise adventure on a galactic scale when guests steer the Millennium Falcon on a customized secret mission in one attraction and engage in a climactic battle between the First Order and the Resistance in another. From the edge of the galaxy “to infinity and beyond,” viewers will discover Andy’s world in the new Toy Story Land to open next year at Disney’s Hollywood Studios at Walt Disney World Resort in Florida. The new family-friendly Slinky Dog Dash roller coaster and the Alien Swirling Saucers attraction will join the original Toy Story Midway Mania! attraction to give Woody, Buzz and Andy’s entire toy collection a backyard play land scaled to render park guests seemingly toy-sized. Ciara will perform a joyful Christmas medley, including “Jingle Bells” and “Jingle Bell Rock” from a sparkling Cinderella Castle at Walt Disney World Resort. Multi-Grammy-nominated trio Hanson will light up the night singing “Finally It’s Christmas,” from their recently released Christmas album. For the first time, viewers will be able to “Glow at Home” during select performances in the holiday special, thanks to the brand new “Made with Magic® 3.0: Connected Ear Hat” and the Shop Disney Parks app. Leveraging Bluetooth® technology, the Shop Disney Parks app enables viewers wearing the new 3.0 edition ear hats at home to sync with the ABC holiday special playing on the viewers’ TVs or other devices. Viewers will feel like they are part of the show. The app also has a remote-control feature to adjust the ear colors and speed of the strobe – a brand-new feature for the Made with Magic® Ear Hats. If viewers at home don’t have the special edition ear hats, not to worry. The Shop Disney Parks app will allow them to enjoy a second screen experience as their mobile phone comes alive, mirroring the spectacle on-screen during select performances. The Made with Magic® 3.0: Connected Ear Hat and the interactive ear hat remote control feature on the Shop Disney Parks app will both be available Nov. 17. Holiday magic is endless as Disney theme parks transform into winter wonderlands filled with seasonal attractions, joyful entertainment, festive décor and special treats that make every day feel like a holiday. The spirit of the season shines even brighter in these magical places where families share traditions and make memories together. For more details about Disney Parks holiday magic, visit Disney Parks Blog and follow Disney Parks news @DisneyParks#DisneyHolidayCelebration and #DisneyChristmasCelebration.